The guys discuss the “Ten Women Who Get a Really Raw Deal in B5” list, which you can find at The Completely Useless Guide to B5. Gary is disappointed that Vol 2 of “Asked & Answered” doesn’t have its own introduction, but other than that all expectations were met, and he’s saving it for voicemails. The other secret involves the long-held secret of the Hyach and how Dr Franklin discovers that the results of their actions centuries ago was the instrument of their own eventual decline. Feedback: Gary responds to one of his own voicemails, letting us know that he’s swamped with Parsecs submissions, and leaves us to mull over the “censorship” of the showing of Centauri female genitalia. Meta Gary Moment! Halfway Day means we’re halfway through the calendar year… and now we know! 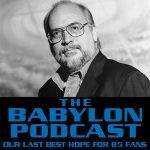 In emails, Brian in NY wonders if a reinvisioning or a rebooting of Babylon 5 be good enough or if a new storyline would be better; Maureen is still working her way through the podcast backlog, and wants to know what happened to Jarsto; Michael comments on Tim and Summer could be missing that B5 had a greater cultural impact than we realized. With regards to Tim’s (or was it Gary’s) comment about the telepaths being given the now empty Markab planet, Sheridan destroyed the gate remember? He did to destroy a Shadow vessel that was chasing the White Star. He also did it because scavengers had been picking the planet clean of technology and other valuables and he doesn’t like grave robber. I think that would have made the planet an even better choice. Only jump capable ship can access the planet now. We take it for granted from the ships we are exposed to but ships capable of opening their own jump points are very expensive and not as common as we see, hence why the jump gates were set up. Gary: At first sure, but then what about if telepaths from other races decide they want to live there too? What if they form a society? Sooner or later there’s going to be a need for trade, and trade’s not so easy to do without a jump gate. Trade without a jumpgate would be more costly, but not unlikely, or impossible. Imagine all the jump capable ships on the Markab homeworld waiting to be restored to flight status. These ships could be used for trading early on. A little further stretch, would the Markab homeworld have enough resources to build or finance a new jump gate itself? Possible. Of course at the same time the colony would be small enough in the early stages to be entirely self-sufficient. Plus I can’t imagine the IA not doing some humanitarian check ups once in awhile, just to make sure everyone’s settling in OK.
And then of course there’s the issue I brought up of other race’s telepaths. 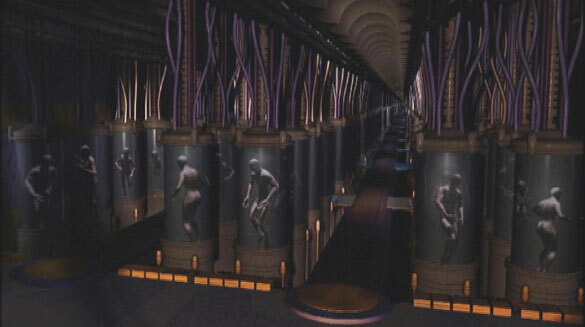 What would the ramifications be if some Centauri teeps got tired of being/never wanted to be in the first place tools of the military, for example, and they wanted to immigrate to the new telepath homeworld? I don’t doubt they’d be welcome, but I also don’t doubt that it could lead to a similar political nightmare for the IA. Hrm, a point or two. Byron was not the only one uselessly cuffed. Same was done to Lyta, later, which would be even more so useless. And yet, even /she/ wasn’t sedated in the same way Bester was. Perhaps it was done to Bester specifically /because/ it was Bester? About which of the two stories in the Secrets of the Soul–for me, personally, it was always about Byron and the telepaths, with everything else around it being a “filler” of sorts, so that we’d still get a general feel of “A regular day in the lives of…” thing, including the Highyak (however that is spelled) story. Or, rather, it always felt as if the story of genocide/gradual extinction was /supposed/ to be the main story but then, somehow, the line of the telepaths’ story overtook it. About the Mimbari and Human souls “interchanging”: Delenn explicitly tells Sheridan at some point that after Valen came into their world they’ve (later on) started discovering that Mimbari souls weren’t being reborn and only after catching Sinclair (some thousand years later) did they understand that “their” souls were “going to Humans”, so to speak. But then we have Lorian (eventually) telling the tale of /his/ race had just stopped being born, and we also get sense (at least /I/ did) that whatever population had remained from the First Ones (that haven’t moved beyond the rim yet)–it’s not all that numerous either. However, Lorian also says that there weren’t many of his race (in general comparison) born to begin with and I kind of assumed the same for all of the anciant races. It made sense to me, especially if we look at how Nature works on our planet (which, I know, is not the only example of possible existence–perhaps–but it’s just logical). The longer a species lives the lesser its numbers to start with. It’s also has this sort of natural mechanism where it doesn’t reproduce as often, its offsprings don’t come in huge numbers -and- have a tougher time surviving till “adulthood”. As an opposite to, say, insects who don’t live long at all (by our standards), yet their numbers are enormous. It just makes sense that if you have a very long time span–there has to be some sort of stopper in your system to prevent you from overflowing the world with just /your/ species. I suppose the point that the Telepath arc is still building and my own indifference about it, that makes the Hyach story seem more prominent in this episode. You theory about population development and growth seem valid, for what we’ve experienced on Earth, but who knows with other worlds. Procreation, might be more of a conscious choice, and less of a biological imperative. Given that Lorien’s race was the first of the first ones, I’d say all bets are off. The idea that every first one civilization would be similar is stretching things a little too much in my opinion. The first ones who already went beyond the rim could measure in the millions. Maybe most already left, and the ones we see are just straglers. I will admit to being somewhat biased in the sense that I have certain belief in regards to “how the universe works” and in such discussions automatically fall back onto those beliefs (in my mind) while making my point. However. I just don’t think that mass migration in billions beyond the rim makes any sense. I mean, we are talking entire civilizations of species that were old even when Vorlons and Shadows were /young/. 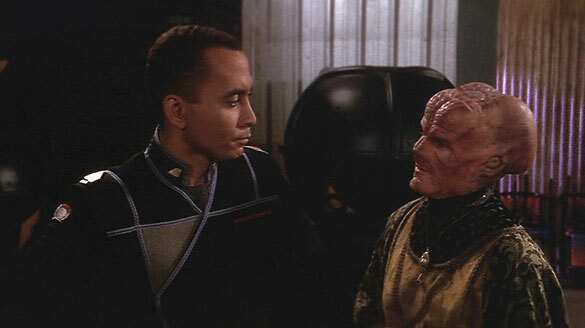 Vorlons and Shadows live very long, so it’s logical to assume that all of the first ones live as long or longer, yes? And if you live this long–you have to be “designed” to counter for that in your numbers. Basing my opining of a general belief that universe itself is conscious and intelligent and everything existing in it is “designed” by it to a certain degree with certain initial purposes … it kind of makes sense to me that the longer you live–the less of your kind there should generally be. I’ve also always had a it of a puzzle with the concept of “beyond the rim” and what IS it. I mean, at first it just seems like the rest of the vastness of space beyond our own galaxy, thus completely unexplored. But then we have Lorien returning for Sharidan to, presumably, take him back “beyond the rim where others have been waiting all this time” (which /I/ understood as those others being Vorlons, Shadows and whatever other remaining First Ones that were gathered for the final battle in the confrontation with Orlon/Shadow fleets with the young races). But Sheridan was actually dying in that moment, when Lori en came for him. So … is “beyond the rim” a sort OD continuity where only beings of energy live rather than just the unknown/unexplored space? /This/ always made me wonder. Uhmn, sorry for the silly typos (even though I’ve checked for them before posting). It should read “Vorlons” and then “a sort of condinuity”. Oh! I’ve remembered one more thing: Lyta=doomsday weapon. I, too, was a bit confused with how she could be /that/ and yet get tired when using her powers excessively at the same time, but then I thought of a few possibilities. To me, it seemed that the more frequently Lyta was tapping into her new potentials–the stronger she was becoming /and/ it was taking less and less of a toll on her. It could be that this was an intention of design, a safety precaution of sorts for her to gradually “gain momentum” rather than risk overloading her senses and her body simply being unable to cope with the stress of the power she now possessed. But also… Alright, an allegory of sorts. An atomic bomb is not becoming that until it touches ground /after the drop/. Anything before that happens is just a metallic shell holding something dangerous and lethal within it. So, what I’m trying to say is that most of Lyta’s power could have been completely dormant unlesss explicitly triggered /from outside/, /by Vorlons/. And since they left and she remained–the entirety of what she /could/ have been isn’t likely to ever be revealed or realized. In other words, she doesn’t have to be able to hold off with easy a dozen P12+ tlepaths in order to be a /plausible/ “doomsday weapon”. I think the assumption that there is a genetic encoded natural limit to population based on longevity to be in error. There are many instances on Earth where food sources, space available or predators are the limiting factor not biology. “Beyond the Rim” is such a euphamism it’s hard to argue it’s literal meaning in the context of B5. Your point is certainly as valid as any other. Seeing Lyta in season 5 really calls into question her “Doomsday Weapon” status. She seemed very passionate and involved in the telepaths clause, but I never really saw anything approaching doomsday level power with the possible exception of the Zocalo scene. And even then controlling at best a few hundred people doesn’t seem like planetary Doomsday type power. Perhaps its only in relations to First Ones, or there left over tech that her powers activate. 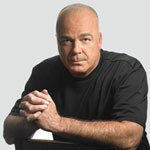 I will agree with this: “There are many instances on Earth where food sources, space available or predators are the limiting factor not biology.” However, “resources, available space and predators”–to me–are very relative and subjective terms, because they change as the way you yourself exist changes. I think that even on a scale of a being like Lorien or Vorlons or Shadows–there are still limits of the surroundings they live in, even if they have access to more plains of existence than us. Lorien tells Sheridan that he is the First of the First. From him, all beings came into existence. (Yet, he never claims the title of God. Interesting.) I got the sense from Lorien’s words that as Life populated the galaxy, the finite amount of life energy divided and divided again, so that there were few First Ones, and many more of the younger races because of this. What’s Beyond the Rim? I think this is one of those definite homages (or plaigarisms) of Tolkien. Lorien taking Sheridan Beyond the Rim is nearly identical to Gandalf taking Frodo beyond the western sea. (Or something. My LOTR is a bit hazy right now.) It is at once metaphysical and corporeal. But I think JMS left it intentionally vague. As far as Lyta’s doomsday weapon status, I think this is metaphorical. Everyone knows a mundane/telepath war is coming – there is much comment about it throughout the series. Lyta represents a wild card- a very dangerous, powerful wild card. She’s certainly not going to offer this power to PsiCorps, and she’s not likely to cast her lot in with the mundanes who have failed to offer gratitude for her services in the past. With no one to control her, the two factions in this coming war percieve her as a major threat to both. Does she have the power to destroy whole worlds and populations? Probably not. But does she have the power to destroy the plans and strategies of both sides? My guess is yes. And when a government or organization cannot control something or someone, it tends to fear that someone. 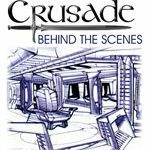 Running behind a bit, but I wanted to thank everyone for their comments about Three-Edged Sword in this episode. We’ve had our struggles over the past year or so, and they unfortunately continue, but we are doing our best to keep the ball rolling! Yes, Lorien is another puzzle (for me). As a general note first, though, I have to say that I’ve watched the whole series, beginning to end, about seven times now (I do it at least once a year–yes, I’m this obsessed with B5 ) and every single time I find something new there–from a simple thought to a concept that I haven’t thought of before or even considered. I also discover new layers about each and every character every time, too. Just listened to the episode, and I wanted to let you guys know that DVD is NOT the only place that Babylon 5 is currently available. It is also available on Hulu.com — at least through the second season — so if you’re trying to get someone interested, you can send them to Hulu to watch it on internet TV and get hooked at any time. Dina, your babbling makes alot of sense. Galaxies seem to be self contained pockets, and an incredible amount of development needs to occur before you can venture forth from them. If you like that sort of future universe stuff, you might want to give the First, and/or Second Foundation Trilogy a read. Asimov, and other authors like Gregory Benford, Greg Bear and David Brin write some great stuff. They deal with empires being built and destroyed, and uniting the Galaxy together. The first book in the series, Foundation, is one of the few books I read yearly. I finally found a hard cover after going through three paperback editions. I keep hoping Summer will do a KAMN episode on it at some point. Ah, yes, thank you Gary for finding a compact way to put into words what I was thinking. I didn’t want to go into a massive argument of why, but that is more or less my thinking as well. Also, thanks for recommending the reading material–I’ll look into it. Well, most of it. Being a Russian Jew–I’m more of a Brothers Strugatsky style school of Sci-Fi and, in all honesty, Azimov is not my favourite author. If I had to pick someone “in his category”–I’d go with Frank Herbert rather than Azimov. Speaking of Strugatsky, though–there is a moment in B5 that, for me, just walked straight out of the pages of their novel “Roadside Picnic” and I’ve always wondered if JMS is a fan of their writing. Pity I didn’t know about him being interviewed by you, guys, in advance enough to ask him about this. The episode I’m talking about is first season’s “Mind War”, where Catherine is saved by G’Kar. the specific moment I’m curious about is where both of them are standing at the flower stand and when Catherine asks G’Kar about whom, does he think, she encountered–he answers her by pointing to an ant. That allegory, in specific reference to “who do you think those aliens are” is something I only saw in “Roadside Picnic” and ever since I saw B5 for the first time–this keeps nagging at me. Some quality deep geeking on this episode. Great work guys! Dina, I agree with you that Lorien is the first in our galaxy. I’m sorry if I gave the impression that I considered him first in the entire Universe. On a tangent, the implied concept that the galaxy is a self-contained unit, and that traveling beyond the rim implies a voyage to parts from which nobody returns, makes me think of the Galactic Barrier from TOS Star Trek. No, yout first instinct was right. Lord of the ringa and/or Arthur being taken–I thought about it and I think that, actually, is a better “explanation” than any other I’ve seen or heard of. Dina, I’ll have to rewatch the episode (thanks for the excuse, but I never got the idea that all life sprung from him, just that he was the first sentient life form to develop. Other life forms developed later on, but with diminishing life energies/powers/developments. Gary: I never thought that Lorien was the “maker of life” either, actually, and have the same vew-point on this as you. 🙂 I don’t remember if he ever /said/ it, but his general speculation (at least the way /I/ understood it) was that he, too, was created BY the universe as everything else IN the universe and that his general point of view on “God” was the same as that of Mimbari.